The Post is a movie you’ll want a physical copy of whether at home, in the classroom, or even (especially) the boardroom! In a time before the viral spread of "news" across the [mis]information highway, the dogged determination and integrity of journalists to uncover and report truths were central to our faith in reputable news publications. Reporters Bob Woodward and Carl Bernstein uncovered and reported the Watergate scandal for The Washington Post; and, chronicled the events in their 1974 book, All the President's Men. In doing so, they inspired a new generation of investigative journalists; furthered when Robert Redford (Woodward) and Dustin Hoffman (Bernstein) brought their story to life in the 1976 film version of the same name. Certainly, it can be agreed that the times are opportune for revisiting this film as a reminder that the standards to which we hold the news media are not just integral to the fabric of our society and culture but to that of any true democracy in which the people are well informed. Except that their story is...well, theirs. It focuses on them as investigative protagonists of the suspensefully told takedown of an arrogant and corrupt administration. That the story ever made it to press is the untold component, even more, à propos today. The Post spares us any retelling of Woodward and Bernstein's travails and avoids becoming too entangled with the governmental transgressions. Directed by Steven Spielberg (really? sigh...E.T. the Extra-Terrestrial; etc, etc, et al), The Post shows us a newsroom as it extends beyond even those offices of the editor and publisher. In their respective roles as editor Ben Bradley and owner Katherine "Kay" Graham, Tom Hanks (Forrest Gump; +++) and Meryl Streep (Doubt; wait...films or Oscars?) are effortlessly adept at capturing the nuanced layers of angst and excitement...discord and validation. As they wade through conflicts born of vying pressures (he's sitting on a scoop while she's contending with the paper's IPO), a mutual respect grows as they endeavor to achieve the common goal of elevating the paper's substance and standing in the world of news. Hanks captures the essence of Bradlee's charismatic, "gruff around the edges" newspaperman. A force driven to chase and print compelling news, Bradlee is portrayed as the noble underdog editor battling a corrupt administration and enlisting (demanding) the support of his paper's conflicted owner/publisher. New journalistic standards were established through his integrity and strength of character. It is important to note, however, that he was still a newspaperman (now, executive editor) who was tired of being "scooped" and buried by towering rival the New York Times. The impetus to reveal the government's deception was also fueled by pride and ego. Bradlee catches wind that the Times is onto a hot story, and he wants it first without even knowing what story he's chasing. For her part, Graham was thrust into taking leadership of the Post in the wake of her husband's death. She and her husband had assumed ownership from Graham's father, Eugene Meyer, who had purchased the paper some 30 years before. In spite of Katherine's decade working at the paper, it was Phil whom her father had named publisher after only a few short months as an associate. Was his choice dictated by the overt sexism socially and culturally acceptable that undervalued women? Could any measure have been a father not wanting to subject his daughter to the atmosphere in the boardroom with which he was familiar? We might not be able to accurately dissect Meyer's character, but Spielberg seamlessly gathers gender inequality and misogyny with the thread of condescension. If the general energy and body language of the board of directors didn't offer enough clarity, their sentiments are encapsulated in two of its members. Fritz Beebe (Tracy Letts; Lady Bird) forcefully whines (in the way that mansplainers do) that "she can't do this." Meanwhile, Arthur Parsons (Bradley Whitford; Get Out) is far more direct with "Kay, people are concerned about having a woman in charge of the paper; that she doesn't have the resolve to make tough choices." But, perhaps the most egregious display comes from Defense Secretary Robert McNamara (Bruce Greenwood; Kodachrome) attempting to leverage his friendship with Graham. His friendly warnings and "advice" are ultimately lost on Kay as she sees through his transparent manipulations and spectacularly shuts him down, "I'm asking your advice, Bob, not your permission." If there is a pivotal moment during which the insecurities subside and the fierceness of a leader emerges, it might very well be when Graham concludes that the social circle and friendships cultivated over years of well-intended interactions is tarnished by the sanctimonious and unethical self-preservation of some of its members. The tense moment when she takes that urgent call while surrounded by those very friends at a party she is hosting dramatically plays out on screen as Streep's Kay is interrupted mid-toast. These moments and the urgency of what is occurring to the characters are key elements in engaging the audience in a story thought previously told. The Post turns the story on Katherine Graham's heel rightfully placing the spotlight on the first female publisher of a major American newspaper whose brave (and ultimate) decision ignited a spark, and helped turn a daily metro paper into a heavily relied upon major news publication. The Post (20th Century Fox) is out now on 4K Ultra HD, Blu-ray, DVD, and Digital HD. The video on the 4K is of course HEVC/H.265 with 2160 resolution and a 1.85:1 aspect ratio. WHile the quality is excellent the footage is made purposely graining to mimic the quality of video at that time in history. The English: DTS-HD Master Audio 7.1 is well done with the dialogue sitting comfortably in the center channels. 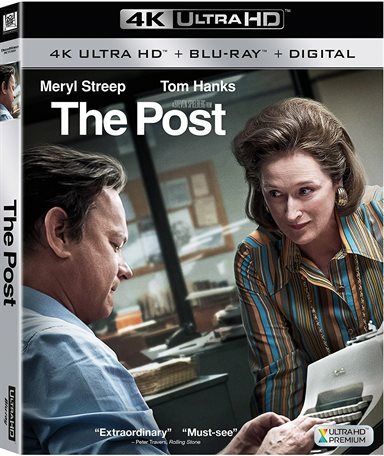 The special features/extras include: Layout: Katharine Graham, Ben Bradlee and The Washington Post; Editorial: The Cast and Characters of The Post; The Style Section: Recreating an Era; Stop the Presses: Filmin The Post; and, Arts and Entertainment: Music for The Post. All are worth a gander as they offer some interesting insight to the story and the film. The gears of the film ramp up from idle as the significant events of the story occurred. It soon gains speed making The Post a film to be shown to a new generation for its many themes from the past that resonate just as strongly, if not more so, today. The legal battle that takes us to the Supreme Court gives us a victorious Streep "entrance" as she exits amidst a generation of young women to be inspired. While the story has been sprinkled with Hollywood magic, writers Liz Hannah (Skin) and Josh Singer (Spotlight) have taken real life experiences weaving them with various common and relevant themes in an easily palatable narrative. They are effective in transmitting the importance of these messages by avoiding delving too deep into the complexities of each. This is a movie you'll want a physical copy of whether at home, in the classroom, or even (especially) the boardroom! Download The Post from the iTunes Store in Digial HD. For more information about The Post visit the FlickDirect Movie Database.